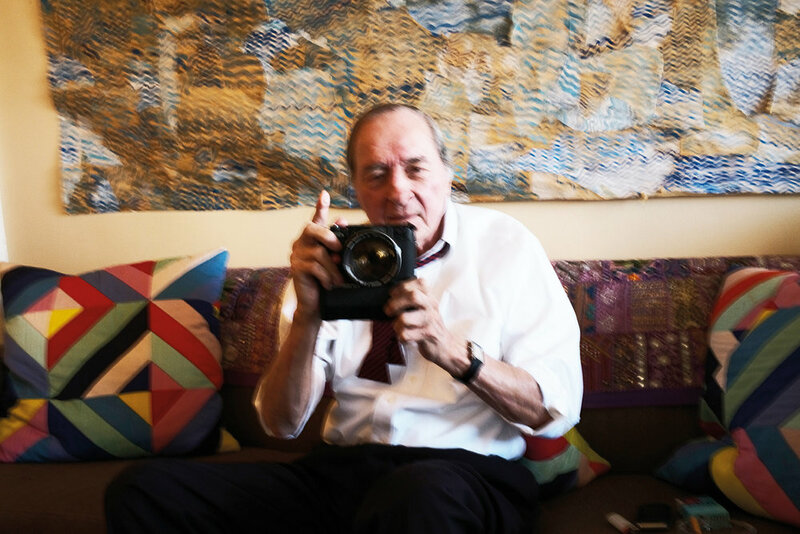 When legendary photographer, William Eggleston, whiskey on the rocks clutched in hand, is telling you a story about Dennis Hopper saving him from falling off a 1000-foot ledge at the Continental Divide, and then asks you to stay for Chinese food, it's hard to say no. What else are you going to do on a Tuesday night in Memphis? In Memphis, you learn about romantic and tragic things: The last song Elvis ever played before dying was "Blue Eyes Crying In The Rain" on his upright piano in the over air-conditioned racquetball courts at Graceland. In Memphis, the cicadas grind like jammed gears in flooded engines. On a dime, the sky can turn from sunlight to shade, like a sheet pulled over a half-living corpse, slowed to a dull kind of subsistence by the tepid humidity. This is the ecosystem, the hallowed Southern environment where William Eggleston's most well known work was born and gave the world a glimpse of its hard edges, saturated colors and sad geometries. If you look closer at his work, you are looking at a microcosm within a microcosm, the moments where the mind drifts and imagines mortal uncertainties - the fragmented glow or nuclei of sunlight reflected through a glass of Coke on an airplane, a girl laying on the grass zonked out on Quaaludes, or the tailfin of a Cadillac and some kind of unaware Americana on the horizon. But, if you look closer still, you will see hidden things, secret things, lost perspectives, living shadows, forlorn personage, but always on the periphery or just under the surface. Indeed, his photographs are very plainly obvious, but there is a certain kind of gossamer stillness that is poetic and serene, and reminds you that life's simple details, the ones that are oft overlooked, are the most important ones. I’ve wanted to sit down with Eggleston for a few years now, and sit we did, in his Memphis apartment – crowded with a looming Bösendorfer grand piano in one room and gizmos and gadgets in another. Eggleston has always been obsessed with mechanics and the way things work – lately, his new obsession is quantum physics. Over cigarettes and the intermittent break to play piano we talk about everything from classical music to photography to the films of David Lynch. Our interview ended after day turned to night and there was no more whiskey. Oliver Kupper: Do you enjoy classical music? William Eggleston: Quite a bit. Mostly. My hero is [Johann Sebastian] Bach. Do you listen to rock & roll music living in Memphis? There’s not much around Memphis right now. I like all kinds of music. You grew up with your maternal grandfather, he was an amateur photographer? My grandfather? He did a little bit. And did you learn about photography from him, or were you first introduced to photography through him at all? No, most of the things he did long before I was around. Most of the things he did were of our family. I saw a few portraits maybe he took of you when you were really small. Was that in Sumner, Mississippi? The whole family grew cotton and it still goes on. You didn’t want to go into the agriculture trade? No, well there’s not much to do. Running a plantation – that just gets kind of boring, sitting around watching cotton grow. It’s not too interesting. Of course, so you turned to more artistic pursuits. Classical music and photography. Yeah, I’ve played the piano since I was about four years old. And you play piano every day? Yes, and the night too. And you talk about Cartier-Bresson having a big influence on your work. Yeah, I still think the world of him. He was one of the greats. When did you first discover his work? I suppose around the 50s. His photographs were all black and white and he worked in black and white for a while. So how old were you at that point? Oh, I had a best friend in prep school, we went to Vanderbilt together in Nashville and he got me interested in his work, and this was 1957. I wanted to talk about another photographer that I’ve always sort of loved and reminds me a little bit of you because he started taking pictures of his friends and family. His surroundings. His name is Jacques Henri Lartigue, do you know his work? Oh yeah, Lartigue I know his work. Yeah, there’s a lot of kindred similarities between his upbringing and also his introduction to photography that is really interesting. We never met, but I know his work. I read somewhere that you were given a Brownie at ten years old to shoot with, and he was given his first camera at seven years old. Did you study his color photography, because he took a lot of color photography too. I don’t have any around here right now, but in the other house, I have his books. John Szarkowski, the curator at MOMA New York who put on your first show, he showed Lartigue’s work a couple years before your show actually. I think he saw something too, which I think is really interesting. Yeah, me and John were very close. He died a couple years ago. He would show me a lot of things I didn’t know about. We spent lots of time together when I was in New York. Did he teach you a lot about photography or the history of photography? And when you first showed those color slides, what was his initial reaction? What was your reaction to showing your work for the first time? Did you feel hesitant at first? We never much talked about it. I was quite happy to show it at MOMA, a good place to show it. And that show got a lot of really interesting reactions. Because I think people were confused about fine art photography in general, not just color photography, but fine art. Yeah, it was something, photography as fine art had to be in black and white – primarily large negatives. And that didn’t much interest me. And one of the critics was Ansel Adams. I didn’t care for his work to begin with. When you first started taking pictures you were largely self-taught, technically speaking. Was it difficult to get the exposure right, did you have sort of a hard time clicking into what you were doing...or you latched onto it pretty quickly? At first I had to use a meter, I don’t really anymore. Film is very forgiving now. Can you remember those first few pictures that you took with the Leica camera? Do you remember that experience? What that felt like? No, but I was happy with the results. There weren’t really many other cameras out besides Leicas that I could use. Are there fine artists outside of photography that inspire you? Lucian Freud was a friend, he died too. He does great paintings. I was in London and I saw one of his last shows. I think when I saw that last show, it was probably right before he died but it was some time ago in London. So, speaking of legends, I want to talk about your meeting with Cartier-Bresson for a second. You got to meet him once, right? Yeah, we were sort of friends. He was absolutely not interested in color. Do you believe in photographic masterpiece? Because there is one work by you that sort of sticks out – the glass on the airplane, I know that a lot of people talk about that one. What was the context of taking that photo? Oh, that was an ex-girlfriend of mine having a Coke, I think we were coming from Dallas to New Orleans. It’s a really gorgeous photograph. How did you come up with using your particular process or did someone mention it to you? Do you mean by that, the dye transfer? I saw it first when, I forgot where, but it was commercial advertising pictures and fashion pictures. The process was really so good that I should use it for my own work and still do. And C prints but not as much; you try to stick with dye-transfer. I use both. I use dye transfer and pigment. But the transfers are really, well whoever is doing the lab work, exposes them through three primary filters, black and white, big negatives of the exact sizes of what it’s going to be. And it’s just...I’ve been around and watched them be made but I’ve never tried to do it. They’re using black and white film, true to the size of the final print. 16x20 inch negatives, three negatives of that same size. It’s really just black and white through filters. Right, which is why your images are sharper. Well the filters are there to separate, rather than to mix together, all of the colors in the picture. The lab technician really had to know what they’re doing. Winston was saying that you’ve been studying quantum physics. What turned you on to that? That’s right. I can’t figure out how to answer that, I don’t know. It’s just physics and then quantum is, of course, close to physics but it’s, I don’t know how to put it, but it’s...the end result is what probably will happen, not what accurately will happen, but will probably. Do you apply those thoughts to photography ever? There’s something about capturing a moment that was moving before, on film, you know? That could be related in some way. It’s like Mr. Einstein once said: no such thing exists as a point absolutely in one place. That’s kind of what quantum is, the probably but not exactly, if that makes sense. I feel probably close to quantum because I think it’s related to my own work, because whatever that picture is, it’s what I thought probably should be there. Not anything exact. That happens so many times every day. I’m dreaming about music and I’ll get up and rush to the piano...(snaps) Gone. Wow, full compositions and such? Yeah, every note, it’s just so beautiful in the dream and then I sit down and face those 88 keys, and I don’t know which one to push. That’s really interesting. Do you ever think about music when you’re shooting? Is music related to shooting at all? I think that’s probably true, there’s some connection. Whatever that is, I wouldn’t even begin to talk about it. There’s a mysterious aspect to how music relates to making pictures. I look at it that way a great deal, probably. Working in quantum physics and theories about pictures – it’s not a bit unlike a symphony or let’s say a set of symphonies or sonatas. I mean the Democratic Forest, it is like a symphony in a way; it is like a multiple part symphony. I think of it that way. It seems, artistically, you’re driven by pure intuition and you don’t over-think things, and you leave all of that to the quantum physics and the mechanics. I want to talk to you about another photograph of yours that was used for the cover of a Big Star album. Oh yeah, that red one? Yeah, you knew Alex Chilton’s mom, right? She had a gallery. Mmhmm. Well they lived here. Her husband played the piano and is in the staged lighting business, but as a hobby. He also plays jazz, which I don’t like. I think jazz musicians are really good. In fact, they’re so good; I don’t really know why they’re playing jazz. There’s a myth that you gave Peyote to Alex Chilton from Big Star. Is that a true story? I probably did. I don’t remember that but...I think he was a teenager and he was just starting to play music. That was probably a big moment for him. Then there’s that other famous photograph of the girl lying on the grass and she was on quaaludes, right? Mmhmm. It looks like she’s asleep, but back then they were so popular. And I want to talk a little bit about your time in New York because that was important. A lot of people don’t imagine you in New York, especially at the Chelsea Hotel. Yeah, the person I was mostly with was Viva, the Warhol actress, we both lived at the Chelsea. The old Chelsea. It was fun, but now the hotel is being re-done. Did you ever meet Andy Warhol? He was rather a distant kind of person. Basically, probably, no. He’s not at all one of my favorite artists. Did you ever go to the factory? You did. Who was around at that time? Oh people like Paul Morrissey, Edie (laughs). And Viva, she lives in Palm Springs now. Do you talk to her? She lives in both Palm Springs and LA now. I see her every time I’m out there. And you’ve shot photographs all over the world? Is there any specific location that you enjoy shooting the most? It doesn’t make a bit of a difference where, physically, I am on this Earth, most everything is the same picture. You were just recently in Sao Paulo. It was an exhibition and I took pictures of people all around. Yeah, and you get a lot of assignments. You’ve been commissioned to shoot a lot of stories. Well, but they’re not assignments, I don’t do those. Those are what I call "open commissions" without any guidelines. It’s quite open with what’s going on right now. The people at Cartier let me do whatever comes to mind. Oh anywhere in the world. And that’s for a show coming up. It seems like Cartier and Agnès b, they’re sort of great supporters of the arts and your work. Agnès and I have been very close for decades. Yes, a long, long time. She works with my daughter right now. You’ve always been very fashionable. Do you find it important to have good style? I never really think about it. I don’t know what to say. Did you get your suits made in London at one point? Mhmm. Several designers, and Stella McCartney just made one for me. She’s just a very swell person. Do you improv more than you play specific pieces and numbers? Probably, yes. Probably more. I love to improv. There’s something jazzy about that. It’s not an easy thing to do. It’s got to be the right tune and if you make too many mistakes it just falls apart. Where did you meet Allen Ginsberg? Oh my god, I don’t know exactly where or when but a long time. That’s sort of the way it was. Where did you meet David Lynch? I don’t know. It’s been a long time, but I don’t know where or when it started. Or what it was even about. But we just get along easily. What’s your favorite film by David Lynch? Probably a cross between Mulholland Drive and Blue Velvet. Blue Velvet is up there for me. I don’t think there is a better film than Blue Velvet. I’ve said this before to a lot of people, I consider David the new Hitchcock. Because most horror films aren’t scary. David’s are scary. Exactly, and my old late friend Dennis Hopper. Dennis and I were very close. I heard a story about Dennis Hopper saving your life? Yeah, he did! In the Continental Divide! He bought some land up there, but there’s nothing there but rocks. I stepped on the wrong one and he grabbed me...it was about 1000 feet down. So, he saved your life. Blue Velvet – especially Dennis Hopper’s character - was one of those films that I saw when I was younger that really changed the way I saw film. He was the sweetest person in real life – he was just a superb actor. I guess what you’re saying is that he wasn’t acting. Essentially. He played those really bad-guy roles but there’s something really natural about that intensity for him as an actor. If Blue Velvet was the first, well he’s been filmed so many times, but the first place where he really did that character to the nth degree. Terrifying. That was a truly scary movie. Yeah, atmospherically too. Even the silent moments were scary. It wasn’t just the ear – the graphic moments, the actual silence of that film was terrifying. It was Dennis and David Lynch, no other two people could have gotten together and done anything like that. Yeah, no one will ever listen to Roy Orbison the same way. I have a funny story about David. David was with a screenwriter friend – do you know Michael Almereyda? I know the name, but I don’t know the person. He’s a very close friend and he was telling me about this person that David had a falling out with who had written, in what David’s hands, could have been a wonderful script. Guess what it was about? I could just tell you, but it was about two cows dreaming. That seems like a David Lynch painting come to life, in a way. Are you looking forward to Twin Peaks? Did you watch the first iteration of it? There’s nothing like that out there. What ever happened about that, did the public not like it or something? Something happened, that it was canceled or stopped. Well, I think there's a new one coming out. When you were watching that show, there was a subconscious sense that what you are watching isn’t like television. Exactly. Hey, you know what – I have to say – it’s so nice to have people visiting me that are so nice and smart. Well, thank you! It’s rare these days. Good, right? I feel that way too. That’s the way maybe it should be. Baby, man, it is hard to be an artist in general and anywhere. Memphis is not kind to the arts. It seems to have this weird idea of what the arts actually are. This goes back to quantum. We’re probably never supposed to figure that out. But you’ve only made one mistake while you have been in this city: you went to Graceland. That was a lesson, we can put it that way. It was very sad in a sense. In many senses, yes. In fact, I don’t know anything better to describe it than ‘sad,’ can you? Just the word 'sad' is enough. It means so many different things at the same time. Priscilla hated the place. Elvis was not kind to her, she said that, very privately, and that was reflected in her taking me to every little square-inch of the place, which took several days, afternoons. And she knew what a horrible, sad place it is and she didn’t say it quite plain, but she had no happy memories of being there. Are family members that still work and maybe even live there? There are not any left. They’re not allowed there. The last person, she was very nice to me, was Aunt Delta, and she was the last person allowed to live there. She had one big room. Someone said she would come down and yell at the visitors. She was very nice to me. The only thing I remember about her, she would cook enormous amounts of fried chicken, I mean enough for 40 people and I was pretty hungry – and she would not offer me a scrap. She was not a gracious lady. There’s a certain tradition around here: to be gracious is next to godliness and without it, you might as well not exist. It’s hard to disagree with that. That’s what I was raised with.